The BNSF Logistics Park Kansas City, in Edgerton, Kansas. Three huge properties with decades of time and effort ex- ern offers detailed specifcations, supply-chain analysis, in- pended in their development and they still lack that one critical dustrial park planning and prospective design work for the component. 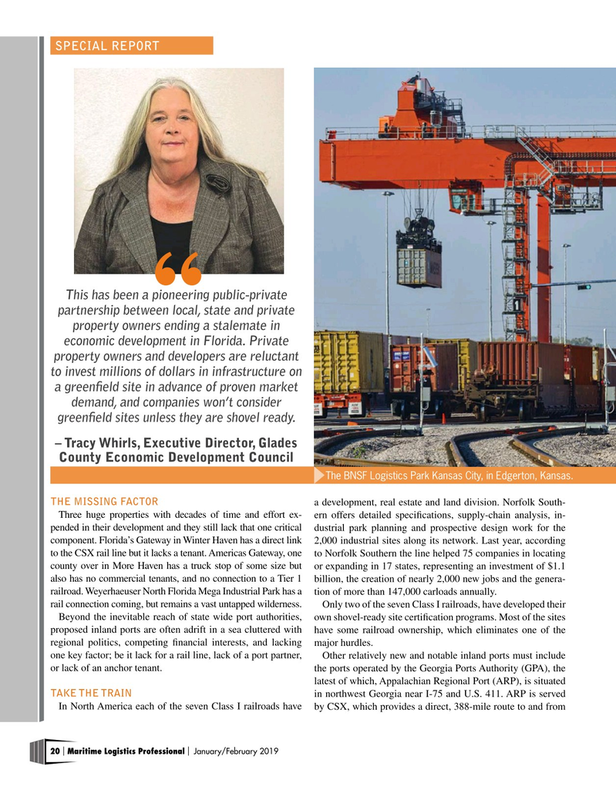 Florida’s Gateway in Winter Haven has a direct link 2,000 industrial sites along its network. Last year, according to the CSX rail line but it lacks a tenant. Americas Gateway, one to Norfolk Southern the line helped 75 companies in locating county over in More Haven has a truck stop of some size but or expanding in 17 states, representing an investment of $1.1 also has no commercial tenants, and no connection to a Tier 1 billion, the creation of nearly 2,000 new jobs and the genera- railroad. Weyerhaeuser North Florida Mega Industrial Park has a tion of more than 147,000 carloads annually. Beyond the inevitable reach of state wide port authorities, own shovel-ready site certifcation programs. Most of the sites proposed inland ports are often adrift in a sea cluttered with have some railroad ownership, which eliminates one of the regional politics, competing fnancial interests, and lacking major hurdles.